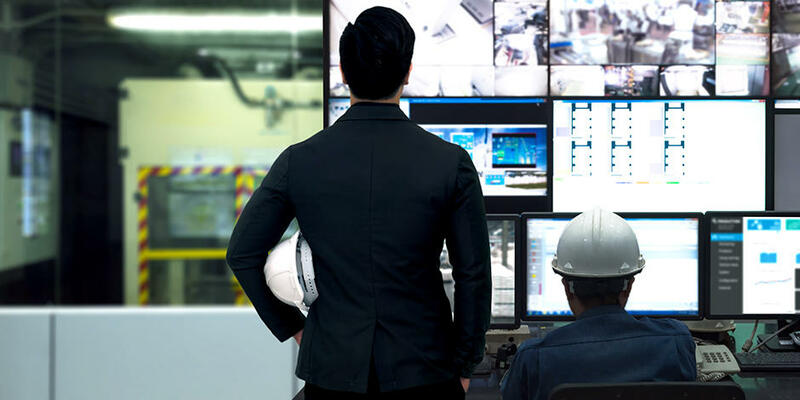 IoT, Artificial Intelligence (AI) and Robotics have the greatest potential to digitally transform businesses, making them more customer-centered and efficient. Tech leaders also see these three core technologies enabling the next indispensable consumer technology and driving the greatest benefit to life, society, and the environment. 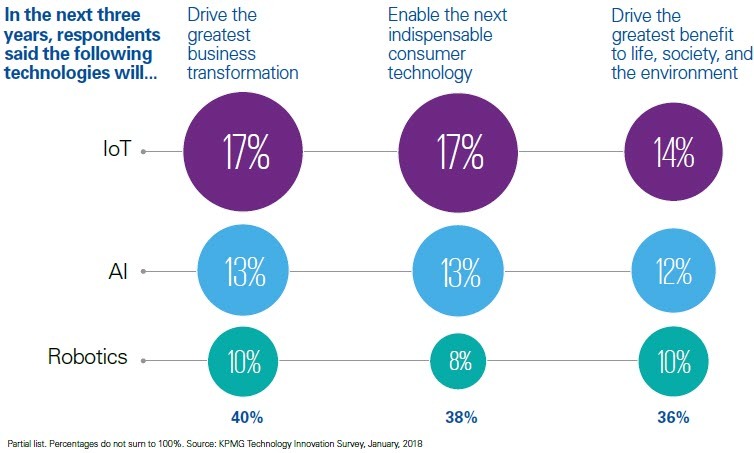 KPMG's research team found that tech companies are integrating these three technologies to create growth platforms for new business ventures while digitally transforming existing business processes. 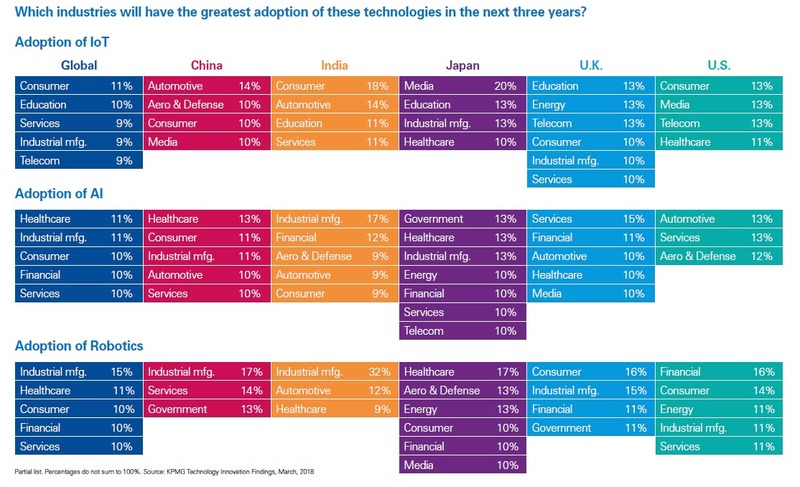 Tech leaders in the U.K. (21%), Japan (20%) and the U.S. (16%) lead all other nations in their plans for IoT digitally transforming their businesses by 2021. Please click on the graphic below to expand for easier reading. 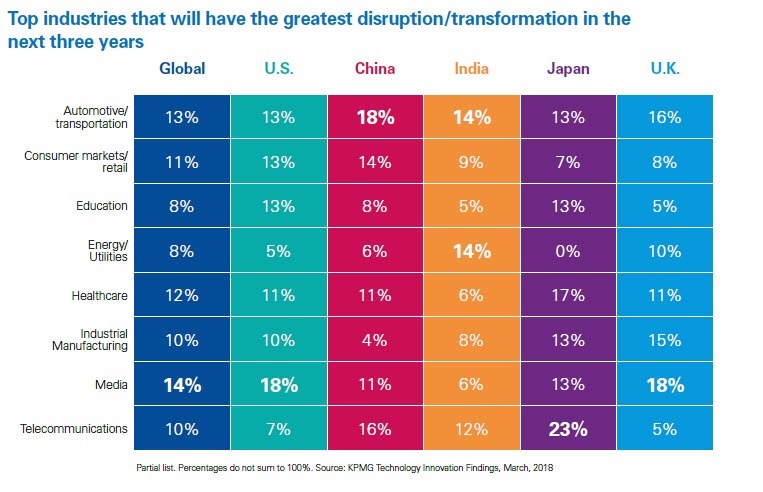 26% of global tech leaders say e-Commerce apps and platforms will be the most disruptive new business model in their countries by 2021. 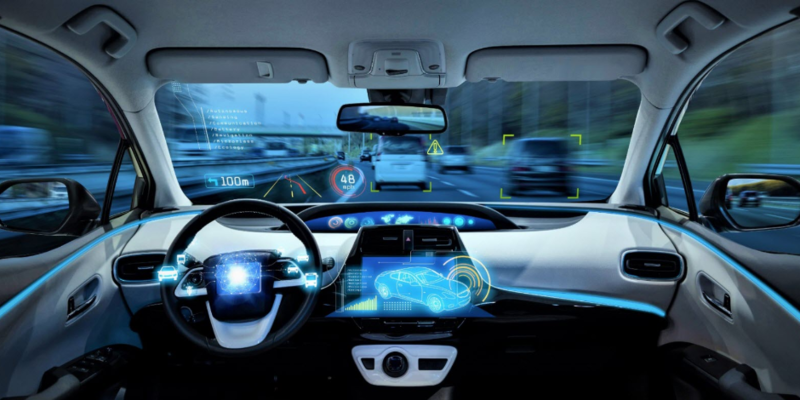 19% see social media platforms creating the majority of new business models, followed autonomous vehicle platforms (14%) and entertainment platforms (11%). 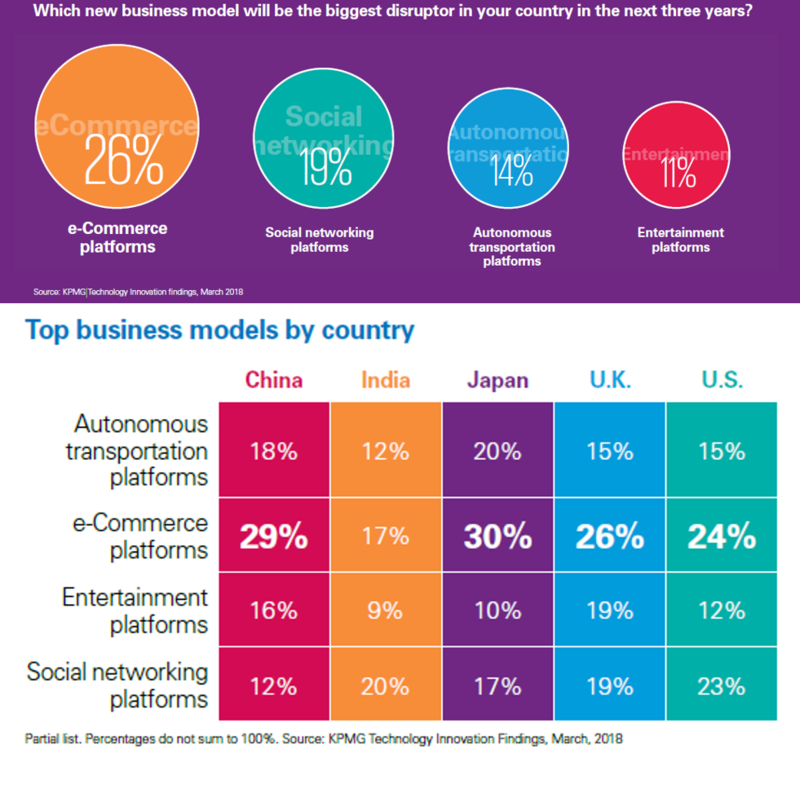 KPMG's analysis includes a ranking of top business models by country, with e-Commerce dominating four of the five regions included in the survey. 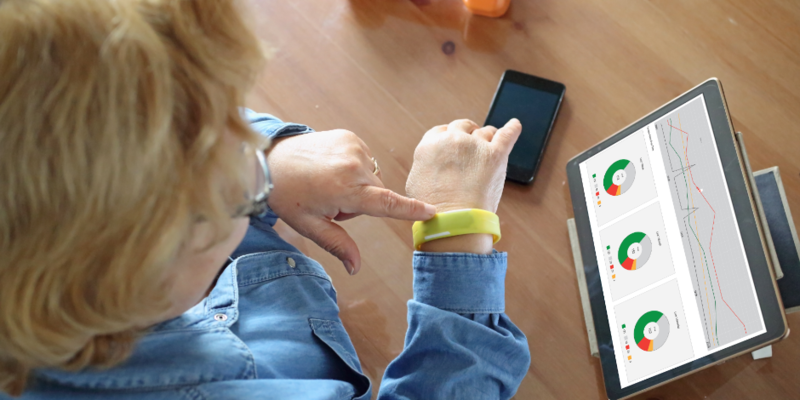 Tech leaders predict IoT's greatest potential for adoption by 2021 is in consumer products, education, services, industrial manufacturing, and telecom. AI's greatest potential to digitally transform business models is in healthcare and industrial manufacturing (both 11%), consumer products, financial, and services (10% each). 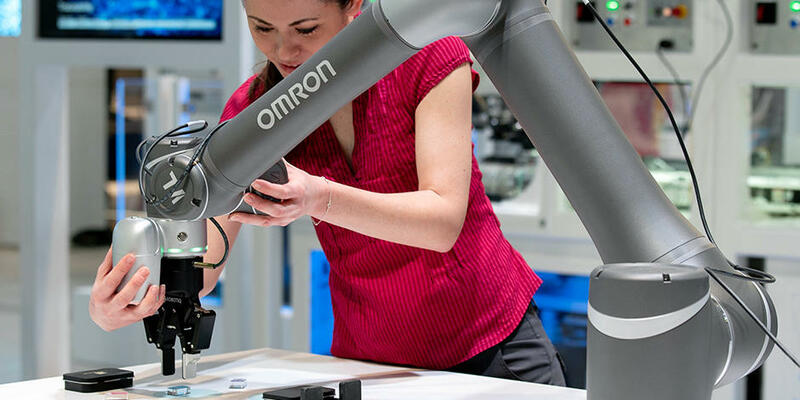 As would be expected, Robotics' adoption and contribution to digitally transforming businesses will be most dominant in industrial manufacturing (15%), followed by healthcare (11%) and consumer, financial and services (10%). Please click on the graphic to expand for easier reading. This article originally appeared in A Passion for Research. This article was written by Louis Columbus from Business2Community and was legally licensed through the NewsCred publisher network. Please direct all licensing questions to legal@newscred.com.